In a conversation a few weeks ago with Trena we both came to the conclusion that our eyesight was changing and it may be time for readers. This was ever more clear to me with my recent blind hemmer purchase. What? I got a blind hemmer? Yeah… I did. This is a Chandler Mini Skipper. It has a curved needle that I spend about 30 minutes trying to thread. I remember as a child my mom would have me thread her hand sewing needles. I thought it was such a joke. I mean, who can’t thread a needle? I’ll tell you who can’t. ME. I got this for $90 on eBay. It’s a Made in Japan vintage model for a company based in Massachusetts. It’s heavy as a toddler at 30 lbs and runs seemingly quiet for a machine of its size and age. Yet, I can’t tell you how it works. Using YouTube I was able to figure out how to thread it. But, the needle isn’t picking up the fabric. I’m going to take it to the industrial shop here in Baltimore next month and get it cleaned up and hopefully ‘fixed’. Like my serger, I’ll let you know what I think. Hopefully this one isn’t a total dud. Wow, I’ve never heard of this machine. Hope you get it working for you. I have always enjoyed hand stitching. Yes, I know, I’m weird, but I like embroidery and needlepoint as well. When I was growing up and trying to learn to sew garments, there was always this glee when I finally got to the hem. I knew I was almost finished! I am looking forward to another post about this machine. What fun, a new toy! 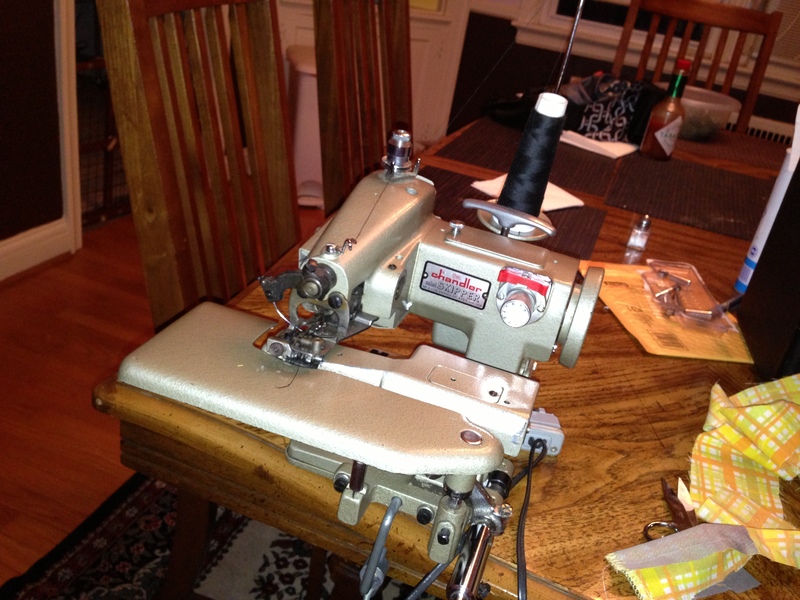 I would collect all kinds of sewing machines if only I had room……….. They are tricky to thread and as with all machines, there is a learning curve. I’m sure you’ll get it figured out! I’ve used one before (looked almost identical, in fact) when I worked in a costume shop and they’re absolutely lovely once you figure out how to use them. Stick with it, I’ll bet you’ll love it! Dig out your big remnants so that you can play with it and get a feel for it. 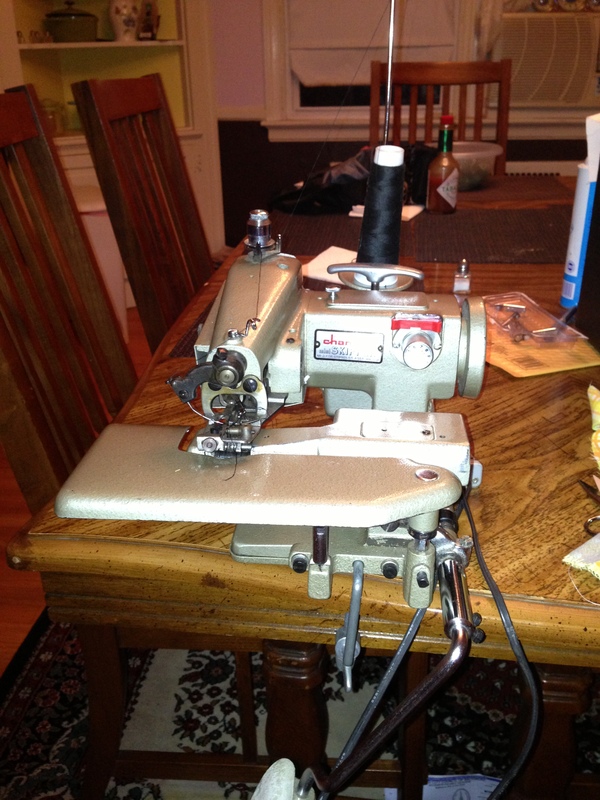 If my sewing machine didn’t have a self-threader, I’d wouldn’t have been able to stitch an inch after I turned 45. I’m nearsighted anyway so readers don’t help much. Good luck with the blind hemmer. I’ve used blind hemmers before… I don’t recall the brand, but I think some elements are the same. I do remember that you could adjust the “bite” it took with a dial on the… right side maybe? It would raise or lower the back half of the “plate”. Maybe yours is too low and so the needle can’t get any bite? That’s *exactly *what I think my problem is! Thanks for making me realize I’m not nutty. I did play around (manually) with these plates at the back. But, wasn’t sure if it was the tension that made the adjustment in them. The threading has be crying though. I’m going to need to get a threader before I can play with this more, lol! I just purchased a new baby lock serger/cover stitch machine. I love it! I’m just serging on it for now- haven’t figured out the coverlock yet. I can’t wait to hear what you think about yours. I’m on the hunt for a coverstitch machine before the year is over. I’ve got a bug to get all the machines I’ve wanted. My mom had one, but I don’t think she ever learned how to use it. At least, I don’t remember her using anything except her regular industrial machine. In regards to reading glasses, I have a pair I only keep next to my machine. (the others are scattered all overt he house) But when I was ready to break out a magnifying glass, I finally learned I could thread it if the thread was fine, rather than cotton. My ego now has me sewing without cotton thread. This, is gonna be me. Cotton is now the devil. So cool! And omg, you got a good deal! I used to work for an industrial sewing machine supply company, so I saw similar machines daily. They are tough to thread! Have fun with your new machine! I have the EXACT SAME blindhemmer. I can get mine to run pretty well, although I’m still getting used to it, too. Turn the dial on the right to change how much it lifts the fabric up. The flywheel runs backward from what you’re probably used to. Mine goes way faster than I can handle, so I tend to turn the flywheel rather than press the pedal. Have you found a manual? I have one at home that I can e-mail to you. It’s for a different brand, but they are so close mechanically that I found it useful. That, would be awesome! I started playing with the dial again last night, but the threading is such a PITA. If you could send the manual, that would be terrific. I started wondering if I had the wrong needle too. Yay!! also- Ebay and craig’s list, kinda addictive, huh? I use a threader with my hemmer. If adjustments don’t work, try a new needle. They get a little more bent as you use them, until they don’t work at all. I’m glad that you’ve got a new blind hemmer – but comment is actually about threading machine needles in general. Although I wear prescription glasses I still have trouble threading my machine. I use two little tricks that you might find helpful too. 1) you know how we always wet the thread?, well it also helps to wet the needle also. With both the thread and the needle being wet – the needle acts a little like a magnet drawing the thread to it. 2) if that fails, try the white paper trick. I cut little strips of white index cards and use the solid side – lineless (1/2″ wide and 2 1/2″ long just to make it easy to handle). Wet the thread (holding in left hand) and direct it toward the needle while holding the white paper behind the needle. The white paper just makes it EASY to actually see the needle hole. Promise this will help. I keep a little stack of them on my sewing table within easy reach.